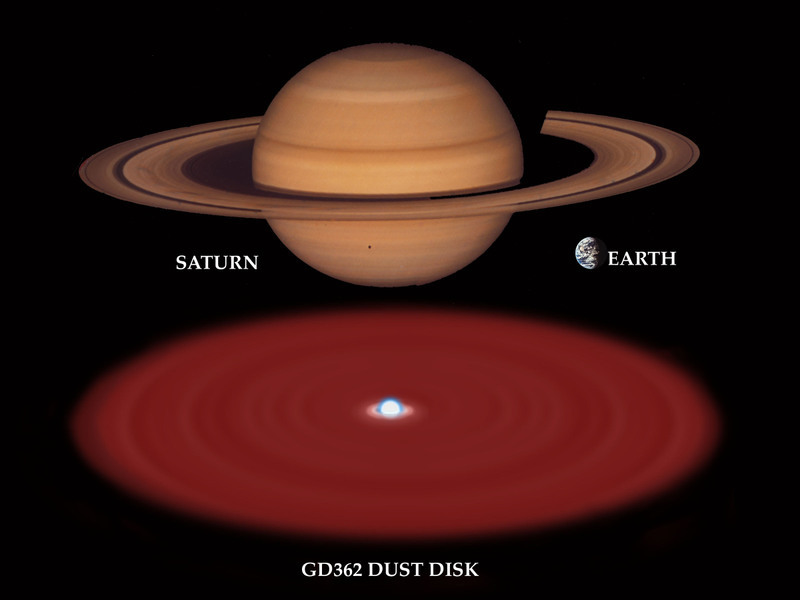 In 2005, E. E. Becklin et al reported in The Astrophysical Journal on " A Dusty Disk around GD 362, a White Dwarf with a Uniquely High Photospheric Metal Abundance" Eighteen years earlier, an infrared excess was discovered associated with the white dwarf G29-38/m . Now new Keck telescope observations of GD 362 show a ring of dust inside the Roche limit of the star, leading to the disconcerting conclusion that the hot white dwarf's metal emission spectrum arises from its having recently smashed and swallowed an earth-like planet. Which former world is, to put it mildly, toast. "have atmospheres that consist almost entirely of helium and hydrogen. But GD 362 is different. Using spectrometers attached to the Keck I and II telescopes at Mauna Kea Observatory in Hawaii and to several other telescopes, a team of astronomers including Michael Jura of the University of California, Los Angeles, identified the signatures of 17 elements in GD 362, including sodium, magnesium, aluminum, iron, and nickel... the levels of these elements in GD 362's atmosphere occur in similar proportions as those on Earth...the team reports in an upcoming issue of The Astrophysical Journal. ...says astrophysicist Alan Boss of the Carnegie Institution of Washington, D.C. "It gives us more proof that planetary systems resembling our own are likely to be common in the galaxy, and that life may be commonplace in the universe."